After the release of last year's critically acclaimed rqo track album, V: HÃ¤vitetty, Finland's Moonsorrow are back with Tulimyrsky which pushes the boundaries of what can realistically be considered an EP with its five tracks and 68 minutes of music. In spite of its immense running time, there is actually only one new track, the title track, with the remainder of the EP featuring two covers (Metallica's For Whom The Bell Tolls and Back To North by Merciless) as well as two re-recorded demo tracks (Taistelu Pohjolasta from the Tama Ikuinen Talvi demo and Hvergelmir from the Metsa demo). Being the only new song on the EP, the title track is the main attraction of Tulimyrsky and it's a whopper, running in at just shy of 30 minutes by itself. Much of what I've read about this EP from other listeners seems to indicate that this track showcases the band's varying styles over the years, much like Meshuggah's I EP does, though without having the benefit of a lot of experience with Moonsorrow and their back catalogue, I can't attest to the accuracy of this assessment. Rather than being a complete 30 minute song per se, Tulimyrsky is more like a 30 minute song that has been divided into movements. These movements fit together as a whole rather well but are separated by interludes and breaks in a similar way to what Abigor does that tie them together and allow them to flow as a whole more seamlessly. Courtesy of the individual movements, the song features several twists and turns but it rarely strays far from the band's well established folky sounds. Over the course of the song there are plenty of acoustic guitars and spoken passages intermixed with some blast beats and other more raw black metal elements. It is truly epic in nature and serves as a mere taster of what may be to come with the band's next full length release. The only negative aspect to this song is that it may take more than a couple of listens before it really clicks, and this is only because of its sheer length. The song is meant to be taken as a whole and really does require the listener to listen to it from start to finish to get the most out of it. Those with short attention spans have now been put on notice. The remainder of the EP, whilst reasonable, doesn't come close in comparison to the Tulimyrsky track. It is likely that die-hard fans of the band will be interested to hear the two re-recorded demo tracks that don't appear to be that easy to find anywhere else and certainly not in this format anyway. They show the band's early style and inspirations quite clearly in spite of their re-recording and overall are a welcome addition to this EP. The Metallica cover has been suitably Moonsorrowed but is neither great nor bad while the Merciless cover flows along well enough but since I'm not familiar with the original I can't say whether they have done it justice or not. The additional tracks on this EP are a welcome supplement to the new song, but the new song is what everybody is really after and those that have been looking forward to hearing some new Moonsorrow material will not be disappointed. 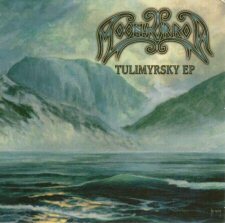 Tulimyrsky is the very definition of epic folk metal and has set a very high standard for the band to meet when they release their next album.